I'm posting this in the Forum to get some feedback, in case you have your own insights in managing Windows Defender/ Firewall. Recently, there has been more support requests for an issue that seems directly related to OOPR.exe being blocked by Windows Defender/ Firewall (not a Mac issue). As you probably know, OOPR or Render Manager (same thing) is a critical part of the SU Podium renderings. 1. Starts Processing Scenes which exports SketchUp materials and surfaces to Podium's rendering engine. Simultaneously, the Render Manager/ OOPR dialog box appears with a message "receiving from network client". If OOPR dialog does not appear, there's a problem. Read below. 2. When Process Scenes is done, there's an automatic hand off to OOPR, where the actual rendering/ raytracing/ resampling work starts and an rendered image is created and saved. 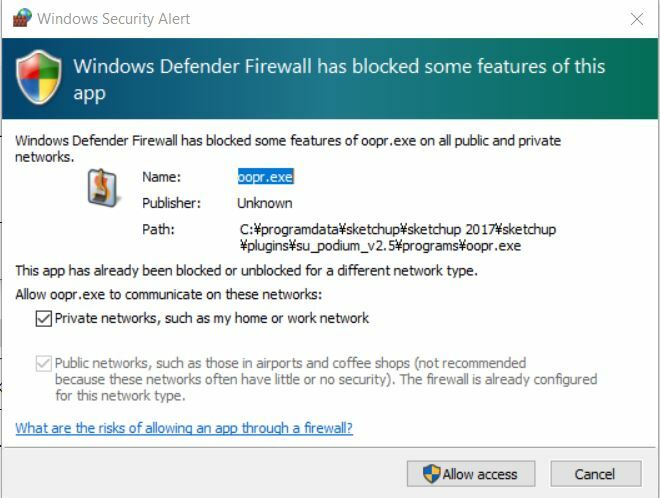 It's not completely uncommon for the new aggressive Windows Defender/ Firewall to block OOPR.exe from starting which disrupts SU Podium. 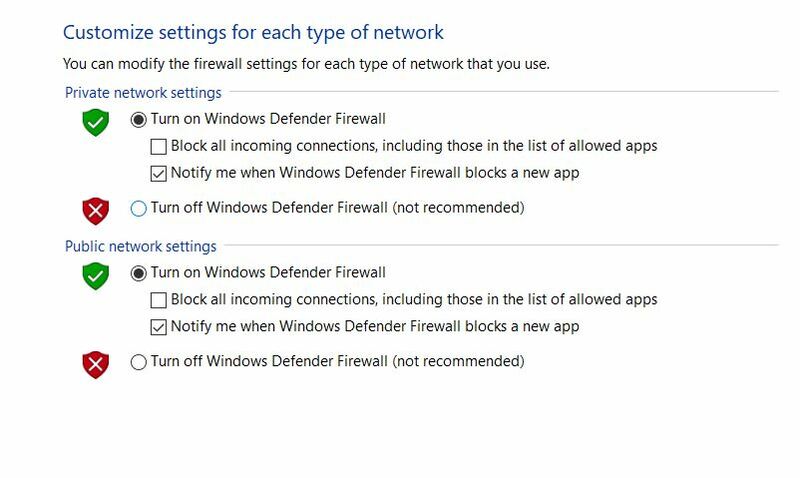 In Windows 10 Defender/ Firewall are combined where as in Windows 7, Defender and Firewall are separate programs. But the issue is the same. In some rare cases, OOPR.exe will be deleted either by a Windows Update or by Windows Defender/ Firewall scan. If OOPR or the Render Manager does not appear after clicking on the Render icon, there's two things you can do to see what is wrong. One is to use Generate Scripts. The other is to see if OOPR.exe has not been deleted. 1. Select Render Manager from SU Podium V2.5 pull down menu. Does it open? If it opens, good. At least OOPR.exe was not deleted. Proceed to below. If Render Manager does not open see, item #4. Read here on how to use Generate Scripts. This is a "manual" way to render. So instead of the automatic hand off between processing scenes to OOPR, Generate Scripts, creates a .scripts file which you manually Add to the Render Manager dialog. It is very easy to use. If Generate Scripts works, then we know that a Firewall (most likely Windows Defender/ Firewall) is blocking the automatic hand off to OOPR. You can turn Windows Defender / Firewall notification ON so that Windows is forced to notify you before it blocks an .exe and allows you to Allow OOPR.exe to continue. This is a lot easier than creating an exclusion. You can use Control Panel or Windows Settings. In Windows 10 Control Panel is not obvious. You have to type Control Panel from the Windows Start button. But for me Control Panel is much easier to use than Windows Settings. So save Control Panel to your Task Bar. In Control Panel, find the Windows Defender/ Firewall icon and open it. By turning on notifications, you will see this whenever Windows Defender Firewall decides an .exe file is suspicious. What if you try to open Render Manager as described above but it will not open?!! It's likely that during a recent Windows update or a Windows Firewall scan, OOPR.exe was removed without any notification to you. Do you see OOPR.exe. No? It was removed. If you do see, it can you open it from File Explorer. If not, it's being blocked. In this very inconvenient case, you will need to uninstall and the install again SU Podium V2.5. But before you do, make sure the Notification described above is ON. Because there are older versions of SU Podium V2.5 being used, using the Manual way of removing SU Podium V2.5 might be best.